Nestled high on a cliff top, on the banks of the Palmiet river, you will discover the exclusive Outeniquabosch Lodge. 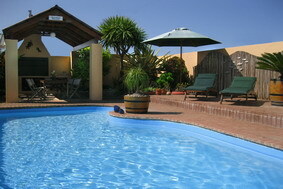 8 spacious one-bedroom chalets are located in a walled garden with its own swimming pool. All rooms offer a breathtaking view of the mountains and swimming pool area. The rooms are located next to each other, ensuring a cosy and resort like atmosphere. Revitalise your mind, body & soul. Only 15min from Mossel Bay. Situated in the gateway to the Garden Route and above beautiful Mossel Bay, Avenues Guesthouse is a place of tranquility - only a few minutes away from the city center, restaurants, the Mossel Bay Golf Course and the Pinnacle Point Golf Course. Luxurious coastal accommodation in the heart of the Garden Route, ideally located in the historic Point Village of Mossel Bay. We offer 120 fully furnished, self-catering units available in Point Village, Santos Beach, Diaz Beach, Nautica & surroundings. Most units are located near the CBD and walking distance from several restaurants and beaches. The flat with a beach view is on the 4th floor in a security complex. It has 3 bedrooms, 2 bathrooms, open plan, balcony with braai. The entire flat is done with old-world blue and white decor. Garage and a lift. Sleeps 6 - maximum 8 persons. Trio Towers is an exclusive apartment development on the Garden Route situated on the last available beachfront site on Mossel Bay's pristine beachfront. Stunning unobstructed views of the ocean and Diaz Beach. Self-catering holiday house with ocean views. It has 3 bedrooms, 2 bathrooms, open plan, balcony with view. The entire house is done with old-world blue and white d�cor. Double garage.Sleeps 6.Outside braai. Your self-catering apartments are situated in the nature reserve of Dana Bay with stunning views on the bay from each room. The separate apartments (40 m2 & 48 m2) for 2 to 4 persons each have all modern comfort with an African flair. Enjoy the jacuzzi overlooking the Indian Ocean.